What Are The Physical Properties Of Carbon Nanotubes? « How Much Do Nanotubes Cost? Carbon nanotubes are being hailed as on the best discoveries of the 20th century, and the amazing physical properties of carbon nanotubes have extended their implications for science well into the 21st century as well. But what is it that makes these macromolecules so special and why are scientists working with them on a daily basis? It’s because of their amazing physical properties—properties so incredible that today they are still being disputed and also discovered. When Sumio Iijima discovered carbon nanotubes in 1991, they were just thin and long cylinders of carbon and it was unknown at the time what the implications of this discovery would be. The physical properties of carbon nanotubes, including their size, shape and ability to be manipulated, yet stay strong, have made them a unique find amongst other macromolecules. 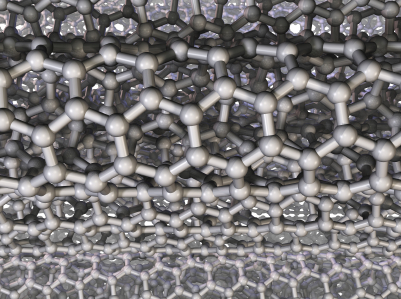 Essentially, a carbon nanotube is akin to a sheet of graphite that has been rolled up into a cylindrical shape. What’s more, this sheet is comprised of a hexagonal latticework, making the physical properties of carbon nanotubes that much more fascinating and strange to both scientists and physicists. But it isn’t simply the construction of the physical properties of carbon nanotubes that makes them so unique and such a hotly debated topic. Carbon nanotubes have been known to change depending on the situation they are placed into. They are capable of adapting and changing to meet the needs of electronic, thermal and structural properties. Additionally, the physical properties carbon nanotubes change based on the type of nanotube being used—the type being defined by the length and diameter of the nanotube as well as the twist (also known as the chirality). The type of carbon nanotube as defined has a great deal to do with determining the electronic properties of a carbon nanotube. The chirality itself determines whether the carbon nanotube is a metal, semimetal or semiconductor and its implications for science and electronics will be determined by its makeup. Carbon nanotubes have been known for some time to be excellent conductors of electricity. This conductivity allows for the use of bundled carbon nanotubes as microscopic tweezers. The physical properties of carbon nanotubes also segue into an area where many other macromolecules have not been found to venture. Carbon nanotubes have been described as being able to exist as a Single Walled Nanotube (SWNT) or as a Multiple Walled Nanotube (MWNT). In the Multiple Walled Nanotube, one cylinder (or rolled sheet of carbon nanotubes) is inside another cylinder, like nesting dolls. Each of these types of carbon nanotubes have their own physical properties in addition to the standard physical property sets for carbon nanotubes and due to the complex nature of Multiple Walled Nanotubes, they often have many defects and are unusable for several of their major physical properties. Some of the major properties of carbon nanotubes are the optical properties. In science, if a macromolecule has optical properties that means that it is has properties relating to the principles of photoluminescence, light absorption and that it is able to register light on the Raman spectroscopy. The abilities associated with the optical physical properties of carbon nanotubes are as yet unclear, but it is possible that the carbon nanotube could have implications in the development of optics, photonics, LEDs (or Light Emitting Diodes) and even photo-detectors, among other optical devices. But the properties of carbon nanotubes are not limited to optical properties. Thermal properties of carbon nanotubes have great implications for science as well. In some experiments, carbon nanotubes have been added to epoxy resin in a successful attempt to double the thermal conductivity in the resin. With this being achieved at only a 1% loading, the experiment proved that carbon nanotubes can be used successfully for thermal management applications when used as part of a composite material. Additionally, nanotubes are said to have elastic properties as well. While these elastic properties are hotly debated in many scientific circles, it is agreed that carbon nanotubes are one of the most flexible macromolecules in existence today. While there are no defined uses for the extreme flexibility of carbon nanotubes, this elasticity could have implications for the develop of a wide variety of products, including bullet proof vests—though the strength of carbon nanotubes alone could merit this segue—and other safety devices. Among the many physical properties of carbon nanotubes is the fact that this macromolecule is anisotropic which means that it is directionally dependent. On the other hand, isotropic molecules are not directionally dependent and do the same thing no matter which direction they are going or being pulled. This property is precisely how carbon nanotubes are able to fulfill the needs of many different physical properties without being deficient in any one area. The anisotropic properties of carbon nanotubes could have implications for a wide variety of fields, including but not limited to chemistry, computer graphics, wood and woodworking, real world imagery, geophysics, physics, medical acoustics, material science, engineering, microfabrication and a host of other fields of discovery and invention that are seeking the perfect solution to every problems. Especially for these work, research and discovery areas the fact that carbon nanotubes are anisotropic means great things for the development of future projects. Not only will carbon nanotubes be able to assist in the enhancement of images seen on a screen, but those seen under a microscope, under the earth and in the sky as well. Additionally, it will be able to enhance dozens of other necessary operations, making these fields work more quickly and more accurately. The physical properties of carbon nanotubes have implications in a variety of work fields and in the way people live their every day lives. Because carbon nanotubes have the ability to work efficiently in several areas of physical property they will not only change the way the world views research and science, but how the world works—how fast it works, how efficiently it works and how well it works in tandem with each project that is presented. This entry was posted on October 12, 2009, 9:22 pm and is filed under nanotubes. You can follow any responses to this entry through RSS 2.0. You can leave a response, or trackback from your own site.